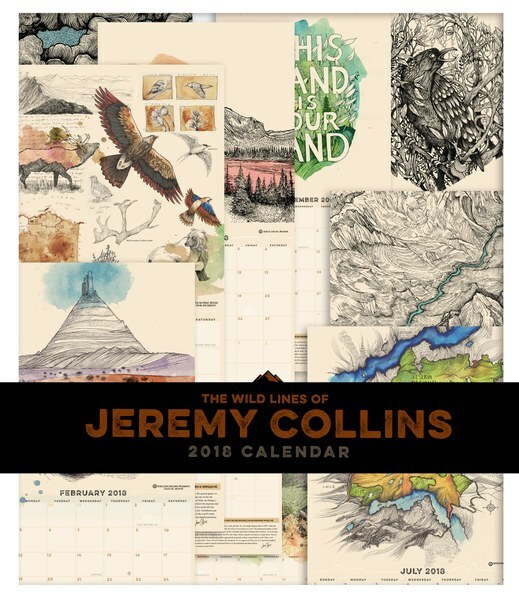 We're excited to offer fans and followers of award-winning artist and climber Jeremy Collins an exclusive opportunity to order his gorgeous 2018 wall calendar. As an illustrator, storyteller, film director, and exploratory rock climber, Jeremy Collins maintains a vast repertoire of skills. His illustrative art has been featured in 115 issues of Rock and Ice, where he is senior illustrator, 45 issues of Alpinist magazine, and numerous how-to books. His imagery has been featured on a variety of products lines throughout the adventure and outdoor industries, and he has designed a line of climbing shoes. 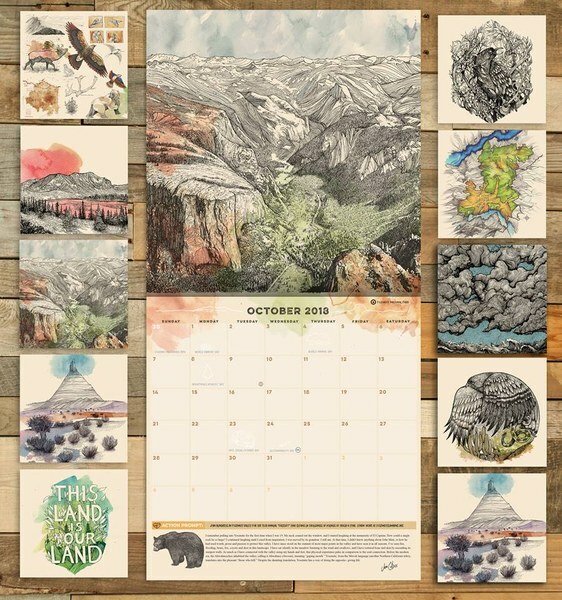 Jeremy’s watercolor maps have appeared on the cover of National Geographic, including for a series on the 8000-meter peaks, and shown the migration patterns of endangered animals for the Freedom to Roam Campaign. The Patagonia catalog has also featured his maps, as well as numerous illustrations and text highlighting his favorite wild places. Deeply committed to giving back, Jeremy has helped raise thousands of dollars for pediatric brain cancer, The Access Fund, American Alpine Club, and water.org among other nonprofits. He currently serves as a section chair for the American Alpine Club, on the board for the Cliff Drive Corridor Management Committee, and as a team member of Rios Libres, fighting to halt a large-scale dam project in Patagonia, Chile. In Venezuela, he was part of a team that delivered solar power to the village of Yunek; he then returned a year later to enhance it and spend time in the village doing creative art projects with the children there. In the past he has served as a board member for Films For Youth, as president of The Kansas City Climbing Club, and as an adjunct professor at the Kansas City Art Institute. In his home town of Kansas City, he has received KC Magazine’s “100 Most Influential Citizens of 2013” for his drawing in response to the Sandy Hook massacre. As a filmmaker Jeremy combines his illustrative work with animation and live-action footage at his studio, ThreeHouse, creating soulful, adventure-based short films that have brought him numerous awards and attention. His film/stage production “The Wolf & The Medallion” won the Banff Center’s Creative Excellence Award and 5 Point Film Festival’s Best of the Fest. On the rock Jeremy has pioneered more than 300 new routes in the United States. He has climbed extensively internationally with notable first ascents in Argentina, Venezuela, Canada, and China. He has received a team Copp–Dash Inspire Award from the AAC for his efforts, as well as the Make Your Own Legends award from the Jonny Copp Foundation. Learn more about Jeremy at www.jercollins.com.